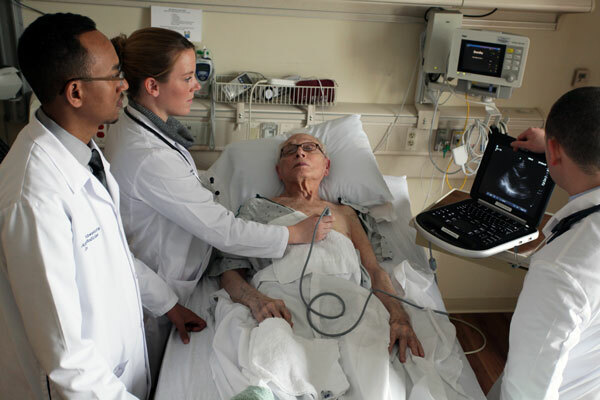 SONOSIM SUMMARY: This observational study aims to assess the efficacy of using ultrasound (US) as a predictor of volume responsiveness (VR) in critically ill surgical patients. Study participants received focused rapid echocardiographic examinations after receiving crystalloid, colloid, or blood, and a variety of metrics were taken in an attempt to find the best predictor of VR. The study finds that multiple parameters are significant predictors of VR, including the velocity time integral (VTI), positional variation in the internal jugular (IJ) vein, and respiratory variation in the IJ at 90 degrees. The study asserts that measuring both VTI and IJ together is a better predictor of VR than any other measurement on its own. In conclusion, the study declares US assessment of the VTI, in conjunction with assessment of the IJ vein, to be the best predictor of VR in critically ill surgical patients. Murthi SB, Fatima S, Menne AR, et al. Ultrasound assessment of volume responsiveness in critically ill surgical patients: two measurements are better than one. J Trauma Acute Care Surg. 2017 Mar;82(3):505-511. The intended physiologic response to a fluid bolus is an increase in stroke volume (SV). Several ultrasound (US) measures have been shown to be predictive. The best measure(s) in critically ill surgical patients remains unclear. This is a prospective observational study in critically ill surgical patients receiving a bolus of crystalloid, colloid or blood. A transthoracic echocardiogram was performed before (pre-transthoracic echocardiogram) and after. A positive volume response (+VR) was defined as a ≥15% increase in SV. Predictive measures were: left ventricular velocity time integral (VTI), respiratory SV variation (rSVV), passive leg raise SVV (plr SVV), positional internal jugular (IJ) vein change (0-90 degrees) and respiratory variation in the IJ sitting upright (90 degrees IJ). For each measure the area under the receiver operating curve (AUROC) was assessed and the best measure(s) determined. Between November 2013 and November 2015, 199 patients completed the study. After the pilot analyses, plr SVV was abandoned because it could not be reliably assessed. VTI, rv 90 degrees IJ, 0 degree to 90 degrees IJ, were all significantly associated with VR (p < 0.05), rSVV and rv inferior vena cava were not. For VTI AUROC was 0.71 (95% confidence interval [CI], 0.64-0.77). For rv 90 degrees, it was 0.65 (95% CI, 0.57-0.71), and 0.61 (95% CI, 0.54-0.69) for 0 degrees to 90 degrees IJ. When VTI and rv 90 degrees were considered together, the AUROC rose to 0.76 (95% CI, 0.69-0.82) for the population as a whole and 0.78 (95% CI, 0.69-0.85) in mechanically ventilated patients. The positive predictive value for combined assessment was 80% and the negative 70%. In a clinically relevant heterogeneous population, US is moderately predictive of VR. Inferior vena cava diameter change is not predictive. IJ change and VTI are the best measures, especially when used together. Future work should focus on combination metrics and the IJ. To read the article, visit the Journal of Trauma and Acute Care Surgery.